First off, thanks again to Hachette Audio/Orbit Books and Libro.fm for my review copy of the audiobook. Christine Lakin’s narration was phenomenal, so thanks to her too! It’s not safe to go in the water. It never was. Nearly seven years ago, media moguls Imagine Entertainmentset sail on a cryptozoology expedition to find mermaids in the ocean above the Mariana Trench. The ill-fated voyage of their ship, the Atargatis, ended in tragedy – the entire ship disappeared without a trace. The only clue to the disappearance of the crew is a single bit of discovered video footage – in which mermaids devour the ship’s passengers. This isn’t The Little Mermaid though – these monsters have gaunt simian faces, mouths bristling with teeth, and wicked claws. Now, with more sophisticated security measures and a full scientific research crew, Imagine is ready to send another ship, the Melucine, out to the Trench to discover what exactly happened to its ill-fated voyage. Some crew come aboard the ship with sophisticated scientific equipment, ready to learn more about the mysterious denizens of the deep. Others are out for blood – and won’t let science stand in their way. Tori Stewart, the main protagonist, falls somewhere in the middle. Having lost a sister to the mermaid attack on the doomed Atargatis mission, she’s devoted years of study to the ocean and the things that lurk there. Tori is torn by both fascination and hatred for the monsters that killed her sister. Dr. Jillian Toth is a no-nonsense sirenologist, perhaps the only scientist that’s devoted her life to finding, understanding, and documenting the existence of mermaids. And her relationship with Imagine’s director makes the mission… complicated. Olivia is Imagine’s media correspondent on the biggest assignment of her career – uncovering the mystery of what happened to the Atargatis mission. She is almost immediately set at odds with Tori, since Olivia is Tori’s dead sister’s replacement. Holly, Hannah, and Hallie are deaf twin scientists and their ASL translator, respectively. Hannah is on the mission to dive further than any human ever has – to the bottom of the Mariana Trench. Holly is a worried twin sister that wants to keep Hannah safe. And Hallie, the only real translator aboard the Melucine, is the twins’ beleaguered mouthpiece to the rest of the crew. The rest of the crew consists of the best navigators, security officers, and scientists money can buy. But, like any situation where hundreds of people are isolated in close proximity, tensions rise. Will the crew of the Melucine discover what happened to the doomed Atargatis? Finding the truth could cost them their lives. Mira Grant, who you might recognize as Seanan McGuire, writes with scientific acuity, leaving no room for hand-waving in her horror. The mermaids are plausible from a scientific perspective, making them all the more terrifying. As the crew unravels the mystery of the mermaids, each revelation is more interesting and horrifying than the last. Like a siren, Into the Drowning Deep really lured me in. (That’s as close as I’ll get to a hook-line-sinker pun.) I’m a sucker for monster stories, and this book delivers on that promise in a big way. I enjoyed all of the accurate science of the book too – swim bladders and desalination and neurotoxins and all the other scientific references in the book helped make the mermaids (or sirens) more flesh and blood than other monster books I’ve read. If I have a criticism of Into the Drowning Deep, it’s that the ending felt rushed. That’s not to say it didn’t pay off, though. The pace just increased dramatically in the last few pages. This could easily set up for another book, which seems to be the case from the book’s title (Rolling in the Deep #1). Why should I read Into the Drowning Deep? If you love suspense and factual science-fiction, monster stories, along with no small amount of Stephen King-esque writing from many characters’ perspectives, you’ll love Into the Drowning Deep. This book impressed me and I’ll definitely be reading more of Mira Grant’s sci-fi thrillers. Oh. And the secret of the sirens reveal was terrifying. And amazing. But mostly terrifying. 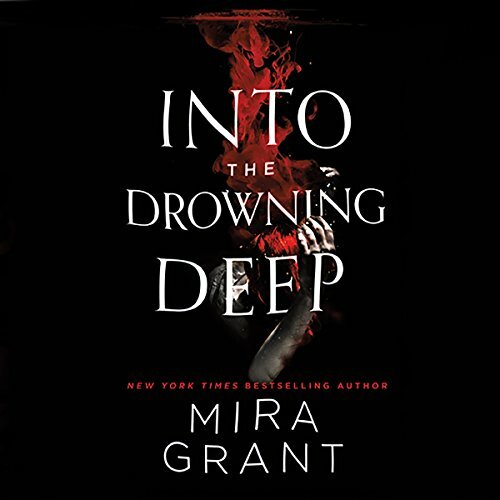 Into the Drowning Deep is the first book of the Rolling in the Deep series. Mira Grant has also completed a prequel novel, Rolling in the Deep, about the Atargatis mission itself.